While the active 2017 hurricane season has focused media attention on Atlantic storms, tropical cyclones continue to disrupt many other tropical areas. 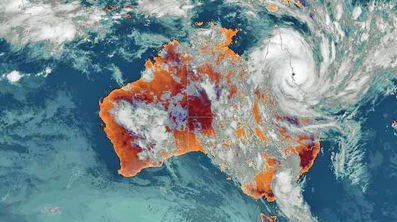 Since 2003, the northeastern coast and Great Barrier Reef of Australia have been affected by a number of category 4 and 5 cyclones; including Ingrid, Monica, Larry, Hamish, Ului, Yasi, Ita, and Marcia. In these regions, sustained high-speed cyclone winds inflict devastating damage to buildings, infrastructure, forests, agriculture, and ecosystems. 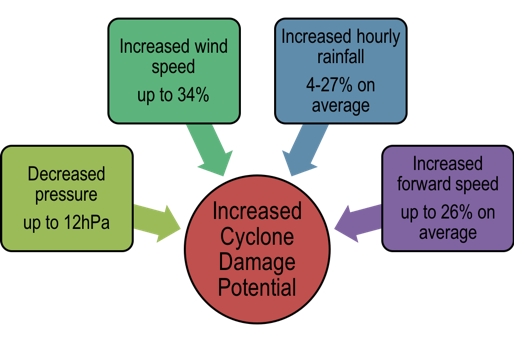 The extent of damage is also affected by other cyclone characteristics, namely storm size, forward speed, rainfall rates, and track. Storm size determines the area encompassed by the storm and thus the total destructive capacity. Associated rainfall and forward speed are often the most dangerous aspects of cyclones, resulting in flooding and pollutant runoff into ecosystems. The track of the storm dictates the areas affected. Consequences can be even more severe if storms strike densely populated areas. With increasing global and local temperatures in the last two decades, the northeast coastal regions of Australia have experienced significantly increased total rainfall, more frequent heavy rainfall, and more intense tropical cyclone events. While most models predict a slight decrease in the overall frequency of tropical cyclones, they predict a significant increase in the intensity of storms, and an increase in the proportion of intense systems with climate change. The effects of climate change on individual cyclone characteristics such as intensity, track, rainfall, forward speed, and size are a critical area of current study. Novel research from Brown University, the National Center of Atmospheric Research (NCAR), and the Bjerknes Centre for Climate Research uses a regional numerical weather model (NCAR’s Weather Research and Forecasting model) to explore future changes in the damaging characteristics of three intense tropical cyclones affecting the east coast of Australia. In other words, this study investigates what the storms would look like in the future climate (assuming no reduction in greenhouse gas emissions). Wind speed (blue) and sea level pressure (red) for Yasi, one of the three tropical cyclones considered in the study. 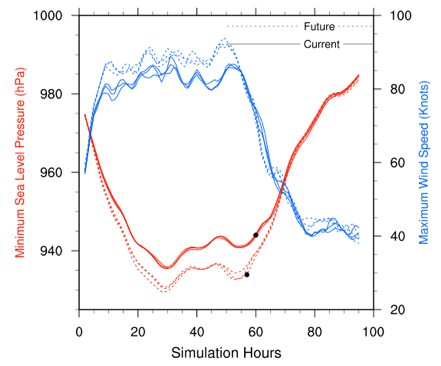 Simulated current climate values are shown with solid lines; future climate with dashed lines. Lower sea level pressure indicates a more intense storm. Figure adapted from Parker et al. 2018. The study revealed a number of interesting findings. The cyclones increased in intensity (pressure decrease by up to 12hPa), and wind speeds increased by a maximum of 34%. The figure above gives an example of the change in intensity and wind speed for tropical cyclone Yasi. Hourly rainfall rates also increased between 4% and 27% on average in the future climate. These increases in intensity and rainfall are caused by increased sea surface temperatures, atmospheric moisture, and atmospheric temperatures in the future climate. Interestingly, there were only minor changes to cyclone size in the future climate. This suggests there won’t be dramatic changes in the total areas affected, but further research is needed to confirm this. The response of storm forward speed to climate change has not previously been addressed in detail. While variable, these cyclones generally increased their speed (up to 26% on average) in the future climate. Although this could reduce total rainfall and flooding extent, it would increase wind speeds experienced at the ground, and could increase the height of some storm surges. The speed change was caused by altered background winds in the future environment that “steer” the cyclones. These winds also affect cyclone track. Since these wind changes are variable in future climate model predictions, the response of cyclone track to climate change was also very varied. The effects of climate change on the suite of tropical cyclone characteristics considered here are summarized in the diagram below. The cyclone changes will have significant implications for wind damage, storm surge heights, and flood damage to urban areas and natural ecosystems. The changes to tracks will alter the areas affected, and future tropical cyclones may impact areas not currently at risk. The vulnerability to and damage potential of tropical cyclones in Northeast Australia will likely be further increased by future population growth, increasing urbanization, agricultural intensification, and other climate-related changes such as sea level rise. Therefore, it is important not only to improve resilience and preparedness for storms, but also to mitigate climate change. A summary diagram of the magnitude of simulated changes in Australian tropical cyclone characteristics given a future climate with no greenhouse gas reduction. These changes will likely result in increased damage potential of future tropical cyclones. Chelsea Parker and Priscilla Mooney contributed to this report. The full paper is available here.